This April is a special month for R3 Communications (R3Coms): from April 9th-12th, Managing Director Mathias Bohge will represent the company at the "2nd China (Shenzhen) Innovation & Entrepreneurship International Competition" (IEIC 2018), before it is decided on April 13th whether R3Coms will receive the German Innovation Award/Start-Up category. Previously, Dr. Bohge won the European IoT Special Finals of the IEIC on March 19th. More than 140 IoT startups had applied for the finals, 18 of which were allowed to compete in front of the international jury. In the end, R3Coms convinced with the technical sophistication of their EchoRing™ wireless system solution, their business model and their customer portfolio. At the grand finals in Shenzhen, a total of 90 finalists from around the world will compete with R3Coms for the title and a total of around 1.3 million euros in prize money. 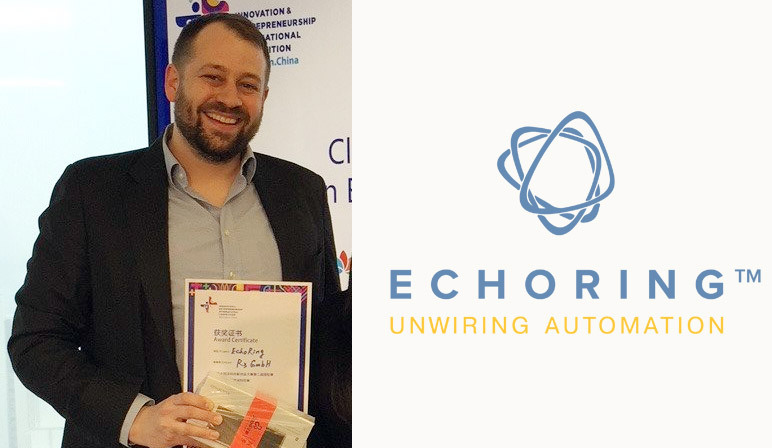 "I am very proud that EchoRing™ has been able to win the high-caliber European competition," says Mathias Bohge, commenting on the entry into the IEIC final. And his MD colleague Florian Bonanati adds: "Of course, China, especially in the context of China 2025, is a very important market for us, even though we are currently mainly involved in the German automation market." In this sense, the nomination for the German Innovation Award is an equally important milestone for the young company. Under the auspices of the Federal Ministry for Economic Affairs and Energy, it is decided on April 13th which of the three nominated startups will take the prize home. The “2nd China (Shenzhen) Innovation & Entrepreneurship International Competition” (IEIC) is the largest and most influential startup convention in China. From April 8th - 12th 90 participating finalists are competing for 10.910.000 RMB (approx. 1,3 Mio. Euro) price money in front of VIPs (VCs, corporate, science & industry leaders) in several categories. The European finals took place in Munich (IoT Special) and Berlin. Accenture, Daimler, EnBW and WirtschaftsWoche have teamed up for the initiative Der Deutsche Innovationspreis (German innovations award) to honor outstanding, trend-setting innovations of German companies that are transforming business and markets with their innovative power. The prize is awarded in three categories: large companies, SMEs, and start-ups. In addition to product innovations, innovative business models, processes and services as well as organizational and marketing innovations are taken into account. The winners will be announced on April 13, 2018 at the award ceremony in Munich.